Situated on 180 acres just west of Downtown Las Vegas, the Springs Preserve is a family-oriented attraction that celebrates nature and history. This property includes several museums, a botanical garden, butterfly sanctuary, nature trails and other attractions. Free parking is available at the grounds, which are also accessible by several RTC buses. Click to book your Springs Preserve admission. The Nevada State Museum is a focal point at the Springs Preserve. Housed inside a contemporary building with a total floor space of 70,000 sq feet, the museum presents the natural and human history of the region. More than 13,000 sq feet is dedicated to permanent and temporary exhibits at this state-operated cultural center. Click to book your Springs Preserve admission . As you browse the galleries, you'll see full-size replicas of prehistoric fossils and some original remains of extinct creatures. Holographic presentations cover the history of mining in Nevada and the American Southwest. You'll also learn about secret atomic tests that occurred in the deserts of the state. Of course, the history of the glamorous Las Vegas is also covered by the museum. Located just steps away from the Nevada State Museum, the Origen Museum features more than 70 exhibits with local themes. You can discover the stories of early pioneers who settled the Las Vegas Valley in the 19th century. There are various installations that simulate the manual-operated technology that was used in households and industries in that era. The Origen Museum also hosts reptiles and other creatures at the Living Collections. Additionally, an indoor theater presents multimedia presentations of Nevada's rich natural history and anthropology. The Butterfly Habitat at the Springs Preserve is a sanctuary that's home to numerous butterfly species, such as the Painted Lady, Monarch, Tropical Blue Wave and Banded Orange Longwing. Most of the residents are native to Central America and South America. The Red Postman, Cydno Longwing and Giant Owl are some examples of such exotic species. The experienced staff members at the habitat will give you tips on attracting the stunning butterflies at the habitat and in your backyard. You'll learn about the specific nectar plants that feed butterflies throughout Nevada and the United States. The botanical garden at the Springs Preserve is an oasis-like paradise in the heart of urban Las Vegas. Of course, succulents and cacti dominate the landscape at this attraction. You'll see various plant species that grow in the Mojave Desert and other regions of the American Southwest or Mexico. The Nevada Agave, Cottontop Cactus, Chaparral Yucca and Seashore Pricklypear are among the dozens of plants that are on display at Cactus Alley. There are also gardens that are lined with roses, herbs, vegetables, palm trees and flowers. The Wildlife Garden usually attracts beautiful hummingbirds and other colorful birds. Additionally, the preserve has more than 3.5 miles of hiking trails in the Natural Area. Get a behind-the-scenes look at the inner workings of water-resource treatment and delivery in Southern Nevada. Learn all about the challenges and achievements of the journey of water as you touch replicated quagga mussels, inspect rock samples excavated from hundreds of feet below Lake Mead’s surface, look at harmful water impurities using a microscope, and more. Located in the operational Charleston Heights Pumping Station, the WaterWorks exhibit is presented by the Las Vegas Valley Water District, Southern Nevada Water Authority and Springs Preserve, in partnership with ONE DROP™, with contributions from the RBC Blue Water Project and Springs Preserve Foundation. Go back in time to the era when Las Vegas was a flourishing railroad town at the Boomtown 1905 exhibit. Walk through historical re-creations of the original train depot, Arizona Club, Lincoln Hotel, Majestic Theatre, First State Bank and a mercantile. There's interactive, interpretive exhibits along with period décor to learn about life in 1905 – 1920 Las Vegas. Visitors can take the Preserve’s trackless train to tour an original restored cottage, built by the railroad in 1910. You can also visit early businesses as you explore the faces and the places of Las Vegas’s past. Open daily 9:30 a.m. – 4:30 p.m. Free for members or included with paid general admission. 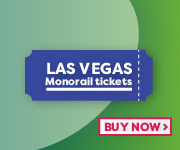 Train transfer tickets to get to Boomtown are free for members or $2 for non-members. Both Boomtown 1905 and WaterWorks are open daily from 9:30 a.m. to 4:30 p.m. It's free for members or included with paid general admission. Train transfer tickets to get to Boomtown 1905 and WaterWorks are free for members or $2 for non-members. The Springs Preserve is located on South Valley View Boulevard in northwestern Las Vegas. You can get to this busy boulevard by taking the Oran K. Gragson Freeway, which merges with Interstate 15 and Interstate 515 in Downtown Las Vegas. The Regional Transportation Commission (RTC) bus route 115 stops near the main entrance of the preserve. Running on Alta Drive, the bus line 207 can drop you off near the southern tip of the grounds. 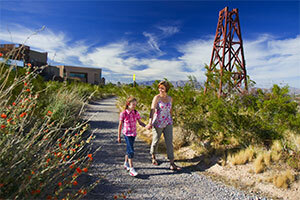 The preserve has free outdoor parking near the Butterfly Habitat and Nevada State Museum. Some of the parking spaces have port-style roofs that provide some shade for parked vehicles. On rare occasions, you might need to park your vehicle in lots at the neighboring Meadows Mall, a major shopping center with over 100 retailers. Click here to visit Springs Preserve official website.